Bob was very professional. Came into the home because we are experiencing major temperature changes in our upstairs bonus room. We are expecting our third child and would like to use the space as a guest room. It is freezing in the winter and extremely hot in the summer. He did a complete inspection and provided easy suggestions that we could do ourselves as well as new upgraded insulation for the space. We highly recommend this company and Bob's expertise. The work will be completed sometime in the near future. On a scale of 1-10, I give Lindley Heating & Cooling a 10 in professionalism & performance. Thank you so much for your prompt attention in regards to my furnace! I had service done by your Serviceman, Justin. Thanks for a great, informative, complete service by your serviceman, Justin. He was professional and very good at his job. Geothermal 30% Tax Credit is Back! Achieving total home comfort requires a number of conditions. Proper heating and cooling functionality is essential, as well as pure indoor air quality to maintain health. Servicing your HVAC system as well as your ducts and ventilation will ensure your comfort at home. Furthermore, efficient heating and cooling and sealed ducts will save you money on your energy bills - an opportunity too good to pass up! Previously named Lindley Heating & Cooling, Indiana Home Comfort Solutions has over 20 years of experience in the heating, cooling and ductwork industry. We can install, replace or repair a variety of heating and air conditioning solutions. We also specialize in ductwork, and in particular we use the advanced Aeroseal system to effectively seal any duct leaks you might have – which, in turn, promotes air flow and air quality. Finally, we can also help with insulation and energy needs through use of our home energy audits. Our competent technicians receive ongoing training to remain up-to-date on industry standards. And, most importantly, we care about you! Together we know we will succeed in giving you the home environment you deserve. Steve Lindley started Lindley Heating & Cooling (now Indiana Home Comfort Solutions) in 1993 as a small business with only one employee – himself! He began in the home improvement industry with a summer landscaping job and then moved on to work in heating and cooling. Over the years, Indiana Home Comfort Solutions has continued to grow and succeed by emphasizing the importance of continuing education and by providing homeowners with efficient and reliable service. 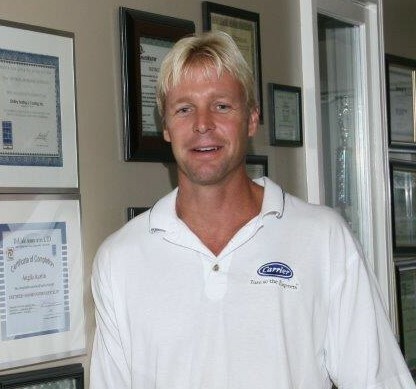 Steve and his staff have completed ample training and certification programs about indoor environments, teaching them to look at the entire internal environment of a home in order to solve a problem, versus just offering a furnace or air conditioning service to fix a problem. Steve is always looking for ways to better serve homeowners, and it all started with becoming a Carrier 360 dealer, Building Analyst and Envelope Professional. Additionally, Steve has recently become a Dr. Energy Saver® Certified Energy Management Consultant! Steve is passionate about his business, working out in the field and in the office to ensure he is meeting the needs of his clients. Steve was born and raised in Hendricks County, where he currently resides. Outside of work, Steve enjoys the company of his wife, son, and two step-daughters. He also enjoys water sports, snow sports, golf, fast cars, riding motorcycles and spending time with family and friends. Here at Indiana Home Comfort Solutions, our mission is to provide our clients with the most comfortable, healthy, safe and affordable home environment possible by acting with trust and integrity. We work hard to achieve complete customer satisfaction and maintain your wellbeing. And we are always happy to answer any questions you may have! We pride ourselves on our many awards and affiliations that prove our prowess in the HVAC industry and allow us to best serve our customers. We are a North American Technician Excellence (NATE) certified dealer, showing our specialization in heating and cooling systems. As a Carrier Factory Authorized Dealer, we are experts in home energy and indoor air quality. We are also a member of Angie’s List and have received the Angie’s List Super Service Award several times, honoring our dedication to our customers and their happiness. These organizations have recognized Indiana Home Comfort Solutions’s worth, and with their support, we feel well equipped to handle all of your HVAC, ductwork, and other needs!